Shahid Khan, Jacksonville Jaguars: NFL owners exist to be hated. NFL owners exist to be hated. 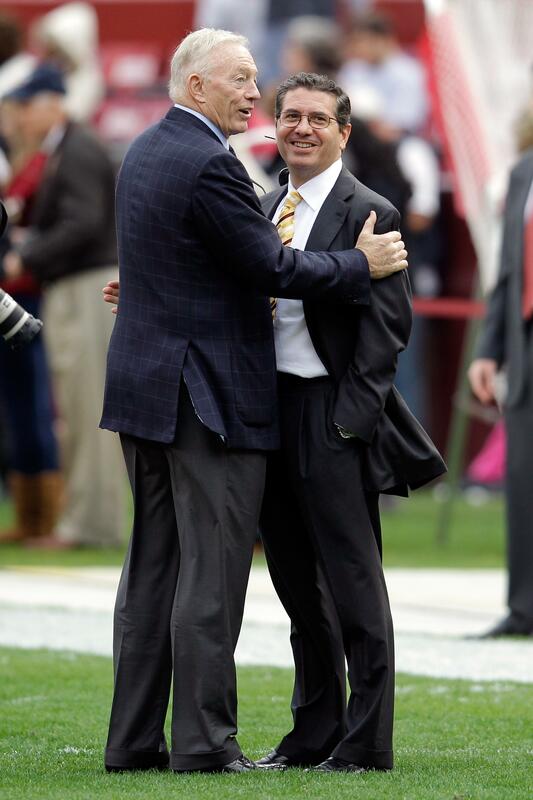 Dallas Cowboys owner Jerry Jones talks with Washington Redskins owner Daniel Snyder. As a mustachioed American, I was pleased to see Jacksonville Jaguars owner Shahid Khan and his glorious handlebar celebrated by the crowd at EverBank Field on Monday night. But as a sports fan, I was appalled. Rooting for your team is one thing; rooting for your team’s financial backer is another. Team owners exist to be hated by the fans; that is their role. It doesn’t take any athletic skill, of course, to purchase an NFL franchise, only the means to do so and a desire to sit in the league’s House of Lords. Once you’ve bought that peerage, you’re one of them—a plenipotentiary from the world of finance, the guy holding the keys to the lockout. If that makes you a villain—a Mr. McMahon for football—then so much the better: Next to you, even the best-paid athlete looks like a humble working man. The best thing about the billionaire owners is their knack for making millionaire players seem like regular Joes. Shahid Khan might try to claim some credit for being a newbie, a long shot, or a Cinderella of the boardroom—he is, after all, an immigrant interloper in the “old white boys club” that runs the NFL. In buying the Jaguars, though, the Flex-N-Gate auto-parts mogul has taken on the job of football boss-man, wherever he’s from and whether he likes it or not. The man is not an underdog; he’s the top dog. Which brings me to the coin toss, and Luke’s touching—but totally insane—paean to unfairness on the field. To say that “humans—particularly those prone to sports fandom—crave” such abridgements of due process ignores not just the entire history of sports fandom, but also a fair chunk of Western culture and a number of key findings in psychology, biology, and economics. In any case, a coin toss might be fair in the sense that both teams have a 50-50 chance of winning it, but it’s unfair because a coin flip shouldn’t determine the outcome of a physical contest. That’s why we should replace the coin flip with something more closely related to the game of football. How about a two-point conversion contest, carried out like overtime penalty kicks in soccer? Or a game of field-goal H-O-R-S-E? Barry, do you agree with Luke that the NFL seems contrived and scripted? Sure, as a national sport with humongous cable and network deals there’s plenty of blather in the broadcasts. But professional football does seem less arbitrary in its officiating and more surprising or improvisational in its outcomes than the other major sports. If I don’t know on opening day who’s going to make the playoffs, I think that’s good enough.